Darko, before you started working with Magento, you worked for quite some time on Symfony framework. During this time, you wrote a lot of Symfony articles on the site. Can you compare it to ZEND? I worked on Symfony 2 over one year, creating a web service based CMS/data-delivery platform for multiple mobile applications that were built in partnership with Surgeworks. Example of sue are Divine Office applications. I don’t like to say that Symfony and ZEND frameworks are comparable at all. Symfony2 is kind of a framework that offers a complete development structure, and thus it significantly speeds up development, while Zend is more like powerful PHP library that requires a well-defined structure that is developer’s responsibility; but offers more powerful utilities. If I will be working on some custom PHP project I would probably choose Symfony 2 as a basic development framework and then would include a ZEND library inside. You had a unique introduction to Magento development. Your first Magento project was “Mageboard”, a Magento iOS application where you were in charge of Magento API communication. What was your first impression of Magento? At first, I was quite scared due complexity and the power of Magento itself – I really had no idea where to start from. But I was lucky because I started developing web services extension that has no UI at all, so I skipped blocks, controllers and other Magento fun stuff to learn on some later project. Of course I need to mention that during that project, I really have mastered Magento API and also wrote some articles about it on our blog. How did you decide to start writing a book on building Magento Mobile applications? What was the story behind it? During my first year at Inchoo, I regularly wrote around 5 articles per month on our blog about various topics: Symfony2, Magento API, Android development. While searching for potential book authors, an author relationship manager from Packt Publishing noticed my blog articles on inchoo.net and sent me proposal by email. After few days of deliberation and consultation with Tomislav I finally decided to take my chances and try to write a first book. And here is the result. Can you tell us a little more about the book itself? What topics does it cover? 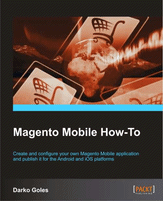 The name of the book is ”Magento Mobile How-To”. It is practical 60 pages mini-book designated to Magento store owners, developers and other readers that want to learn how to build own Magento Mobile application targeting iOS or Android platforms. For those who don’t know: Magento offers a simple and effective way to transfer your web shop to mobile devices by creating mobile application using their Magento Mobile services. How would you rate your writing experience? Can we expect more titles from you in the near future? There were nice and also hard times for me while writing this book. However, nothing could replace the good feeling I had when the book was completed. Hallo Darko, eto i stariji ljudi kroz surfanje u internetu dodju na stranice koje su za nas nepoznate, tako reci van naseg svijeta. Tako sam nasla i tebe i tvoju knjigu i stvarno se ugodno iznenadila citajuci sve komentare. Ja sam ponosna na tebe i na tvoje uspjehe. Puno srece i uspjeha i nadalje. tvoja teta Nena. Rumor says that fame and glory Darko achieved after publishing encouraged one more Inchooer to start his own book.